Before explaining some of the differences between casting and forging, let's take a moment to consider two materials that commonly undergo these processes: iron and steel. Iron is a very familiar material in our daily lives and is used to create various tools and other products. Iron is also the primary component in steel alloys, so how are these two materials different? The first important distinction to make is that the term "iron" as used in everyday conversation does not always refer to pure elemental iron; often, it refers to an iron alloy. Elemental iron has a very high melting point, and is used to produce various iron and steel alloys which are then classified depending upon the production method used and the percentages of iron, carbon, and other elements present in the alloy. Everyone likely knows some basic differences between iron and steel and can identify a few common objects made from each. Objects such as a traditional tea kettle or a roadway manhole cover may be made from cast iron, whereas examples of steel use include kitchen knives and steel pipes. The variety of iron and steel alloys available provides a wide range of materials to choose from based on the properties desired. Other factors such as regional standards set by governmental agencies may also affect which materials are selected for certain industrial equipment. The primary compositional difference between steel and iron is the amount of carbon present in the alloy. Cast iron typically contains greater than 2.0% carbon by weight; to produce steel, carbon levels are reduced to between 0.008% and 2.0%. Cast iron has a relatively low melting point (lower than that of elemental iron), while steel melts at a higher temperature than cast iron. These differences have significant effects on how the metals can be shaped and used. 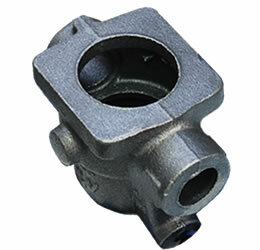 Cast iron's lower melting point and the ease with which it flows are key reasons why it is commonly used in the casting of a wide variety of products. As its name suggests, however, cast iron is meant solely to be cast; it cannot be forged. Additionally, while it excels in casting capability and in achieving the shape set by the mold, cast iron cannot be reliably welded due to its higher carbon content, which causes a brittle weld. 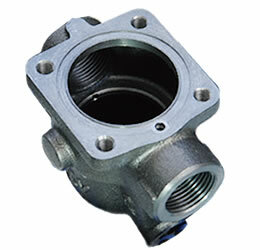 As such, it does not provide the strength nor piping connectivity typically required by high-pressure, high-temperature applications. In such instances, steel is an appropriate choice. On the other hand, steel can be either cast or forged into the desired shape. It can also be welded and is generally stronger than cast iron, making it a suitable choice for high-pressure, high-temperature use. The most common steel alloy is carbon steel. However, depending on the intended purpose of the final product, the material can be comprised of higher grade alloys such as stainless steel or molybdenum steel. Typically, such special alloy steels will be chosen for their higher resistance to corrosion and wear or to meet high temperature requirements. Cast products are made by completely melting the material into a liquid state and then pouring it into a mold to solidify. The material takes the mold’s shape as it cools and is then removed from the mold once solidified. A cooking pan is one example of an everyday item made by casting with iron. This animation depicts a general example of casting based on the sand casting method. Forging is the process of shaping a metal (commonly in ingot or sheet form) using high pressure, either by striking it with a hammer or by pressing it with a die. The material is often heated beforehand in order to make forging easier, but it remains solid throughout the process. Kitchen knives and other knife blades are typical examples of products made via forging. Since steel can either be forged or cast, manufacturers usually specify the actual material grade and type as "cast steel" or "forged steel" to clarify which process was utilized. This animation depicts a general example of forging based on the drop forging method. Cast vs. Forged: What Difference Does it Make? Products with intricate contours are best created via casting because of the relative ease with which the material can be shaped. By completely melting down the material and pouring it into a mold, casting is effective in creating products with complex interiors such as those which require chambers or other hollow areas. 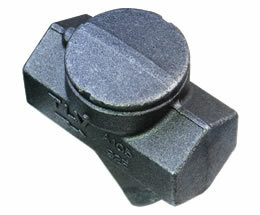 TLV creates FreeFloat® steam traps via casting in order to provide the various passageways and space inside the trap necessary for the FreeFloat® to operate. Since the forging process forces solid material into the necessary shape by applying large amounts of pressure, it is not an ideal method for products that require hollow spaces or complex designs. In order to produce such products via forging, it is necessary to carve or open holes later in the machining stage. However, forging steel is a relatively quick process and can offer greater strength and uniformity. TLV creates high-pressure disc-type steam traps via forging since their design is relatively simple, and they do not require much hollow space or subsequent machining. As mentioned above, steel can be either forged or cast. However, if casting allows for greater flexibility in creating products with more sophisticated shapes, why not simply cast all valves? Actually, neither shaping method is superior, as both forging and casting offer their pros and cons depending on the specific application requirements. Steel's high melting point makes it more difficult to cast, and there is risk of air cavities forming if the molten material is not able to flow into every crevice of the mold. On the other hand, forging offers lower cost when manufacturing in high volume, but may also present certain risks of its own, such as misalignment. Misalignment when forging can lead to improper shape, fracturing, or other damage to the product. Therefore, in order to create a product which properly balances cost vs. quality, it is important to consider all characteristics, such as product size, intricacy of the shape, the amount to be produced per lot, and the amount of necessary machining processes after initial shaping. Ultimately, the final decision to forge or cast should be made by selecting the method which offers the optimal balance of these factors.